Themes have always been an exciting way to tailor a birthday party experience to the guest of honor. With party supplies available for the even the most niche theme available, a vast choice of themes can perfectly exemplify even the pickiest individual. Though there are many different themes that can be chosen for a birthday party, these are the most common. With the expansion of the DC and Marvel Universe over the past several years, children have found a newly restored love for superheroes. 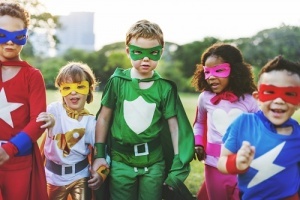 As the popularity of these movies grew, the availability of superhero themed party supplies grew with it. Make the guest of honor feel like a superhero for their birthday with this popular theme! Regardless of when they first came out, Disney movies are still as popular today as they were at first release. Disney princesses are still adored and idolized by even the youngest girls today. This party is very popular among young girls and allows them to dress up as their favorite princess and create a magical memory. It is not uncommon for children to have a favorite movie or cartoon that they request to watch incessantly. Whether that request is SpongeBob or Thomas the Train, there are most likely party decorations available. In most cases, this party theme choice can end the request to watch the same episode over and over again, even if just for a short period. The popularity of Peter Pan and Pirates of the Caribbean still exists to this day, propelling a love of pirates and nautical lore. Even during Halloween children can be seen parading around the streets in sea-worthy costumes seeking out their next treasure. If you can hear the sea calling, this theme is perfect!